Preparation time: 15 minutes. Freezing time: 1 hour. Standing time: 5–10 minutes. 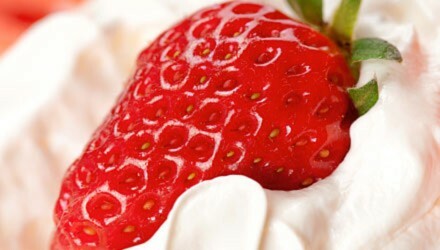 Sweeten chopped strawberries with artificial sweetener, if desired. Drizzle Amaretto over berries and toss to coat. Stir in yogurt then whipped topping. Spoon about 1/3 cup of the mixture into each pie crust, until they are nearly full. Slice remaining strawberries in half lengthwise and garnish each tart with half a strawberry. Place the tarts on a tray and freeze them uncovered for at least 1 hour, or until firm. Transfer to an airtight container and keep tarts in freezer until serving time. Remove from freezer 5–10 minutes before serving. Exchanges per serving: 1 starch, 1/2 skim milk, 1 fat. Carbohydrate choices: 2.